100% Brand New with excellent workmanship, Precise golden mechanical movement. No need to use battery, Twisting the top button on the spin by clockwise about 15-20 arounds, Tightening a walk for 24 hours, Please wind up the watch before every usage and keep away from magnet to avoid making it stop working. PERFECT CHOICE - Come in with Good Quality Brand SEWOR Leather Gift Box, Perfect gift for your love and family and yourself. Best Valentine day Gift, Superb Christmas Gift, Birthday Gift, Wedding Gift etc. For the working environment which is not allowed to wear wrist watch, like chef or nurse. This Pocket Watch under our private brand \"SEWOR\" is a great choice for a birthday, Christmas, working gift. Each watch is with a elegant gift box. 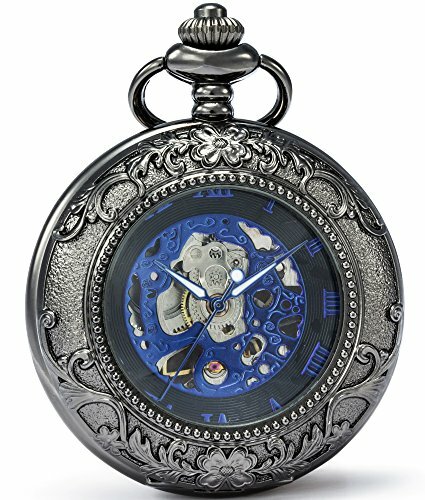 The pocket watch with a exquisite dial and read the time easily at anytime when working. We also have products such as watches, pcoket watches, pendant watch and cufflink. For More \"SEWOR\" brand products, you can use \"SEWOR\" keyword search in our store. If any question,please feel free to contact us.